Alex Hanimann, 235.604 – 1789, 112 lino engravings on ivory satin cardboard 240 g/m2, black and red, presented in a black box, 32.5 × 24 cm, edition of 20 plus 2 A.P. and 2 H.C., numbered, dated and signed. Edition of the Centre genevois de gravure contemporaine, Geneva, 1994. Exhibition and edition of a book object, 235.604-1789. 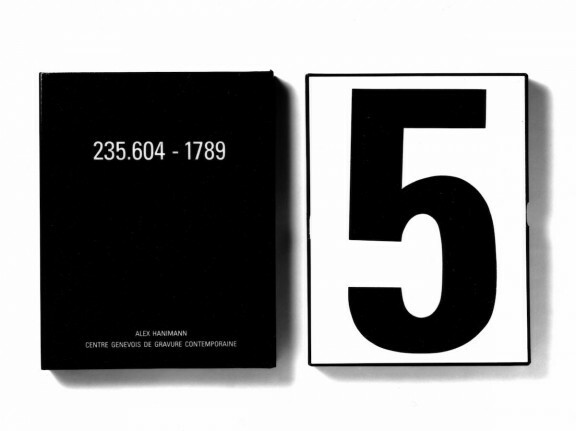 The texts or fragments of texts used by Alex Hanimann are often indifferently extracted from manuals, philosophical maxims or political slogans.